Selected and narrated by Ewan Tytler, U.S.A. There is little disagreement about which were the two best Grands Prix of the 1970's. The following two races may also be the greatest Grands Prix of all time. Both of these races reminded us why Formula One is the pinnacle of motor racing. Both races had unexpected results, drivers fighting tooth-and-nail for position and ended with grandstand finishes. Amazingly, none of the drivers involved in these two epic battles became world champions. Both of these titanic races happened because the drivers could drive close to each other, as the application of aerodynamics to Formula One cars in the 1970's was quite crude, and because the circuits were open and not constricted by chicanes. In both of these races it could be said that the lucky drivers were the ones who retired and could witness these amazing events. On September 5th, 1971, 23 Formula One cars assembled for the 42nd Italian Grand Prix. Monza was famous for slipstreaming during races and this Grand Prix would go down in history as "The Slipstreamer at Monza." On pole position was the Matra-Simca of Chris Amon, beside him the Ferrari of Jacky Ickx. On row two were the BRMs of Jo Siffert and Howden Ganley, on row three the Tyrrell of Francois Cevert and the March 711 of Ronnie Peterson. The world championship leader, Jackie Stewart, and the Ferrari of Clay Regazzoni were relegated to the fourth row. Various components had been stripped off cars to reduce drag. Peterson's March had no front wing while Henri Pescarolo's March had a front wing but no radiator covers. When the flag dropped the pack sped down to the Curve Grande led by Regazzoni, with Peterson, Cevert, Ickx and Stewart in hot pursuit. By lap 4, Peterson led and John Surtees was the first retirement. By lap 6 three more drivers were out. Lap times dropped as the fuel load lightened. On lap 9, Frenchman Henri Pescarolo, set fastest lap of 254.0 kmph (154.4 mph) with his March. By lap 16 both Stewart and Ickx had retired due to engine failure. In two more laps the engine of Clay Regazzoni's Ferrari had expired. Now only the underdogs were left to battle the lead. None of the leading group had won a Grand Prix. On lap 41, Pescarolo's rear suspension failed. With seven laps to go Amon's Matra Simca led the pack. Amon looked set to win his first Grand Prix when disaster struck - while ripping a tear-off strip from his visor, the whole visor came off in his hand! The luckless New Zealander would finish sixth with no eye protection. The lead battle was now between Peterson and Cevert with Ganley, Mike Hailwood and Peter Gethin making up the leading pack. The lead changed over 30 times and eight different drivers held the lead during the race! Peterson led most of the race and he started the last lap in the lead. Cevert overtook Peterson entering the Lesmos. On the approach to the Parabolica for the last time Peterson prepared to retake the lead under braking but Gethin dived on the inside of both Peterson and Cevert. 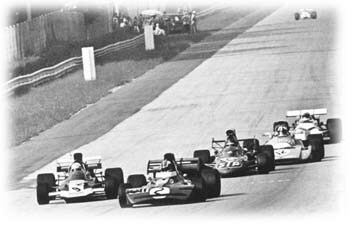 Peterson and Cevert let Gethin through and the pack of five cars sprinted towards the finish line. As the checkered flag fell it was a photo-finish between Gethin and Peterson with Gethin winning by 0.01s. This was the fastest (242.615 kmph), shortest (1h, 18 minutes and 12.6 seconds) and closest finish in Grand Prix history. Ground-effects cars with normally-aspirated 3 litre engines were the industry standard for 1979 but the turbocharged 1.5 liter Renaults had yet to realise their potential. On July 1st, 1979, the 45th French Grand Prix was held at the Dijon-Prenois circuit. At 3.8 km, Dijon-Prenois was the second shortest circuit in Formula One and was set in rolling hills with sweeping bends and many changes in elevation. The pride of France was on the line. The Renault team had French drivers, an all-French car, Michelin tyres and ran on Elf fuel and oil and had yet to win a Grand Prix. Jean-Pierre Jabouille set pole position and his Renault teammate, Rene Arnoux, joined him on the front row. On row two was the normally-aspirated Ferrari 312T4 of Gilles Villeneuve and the Brabham-Alfa Romeo of Nelson Piquet. On row three was the Ferrari of the championship leader, Jody Scheckter, and the Brabham-Alfa Romeo of Niki Lauda. Villeneuve had a reputation as the wild man of Formula One. Sometimes the former snow-mobile racer would drive like a genius, at other times like a lunatic. At Dijon, Villeneuve the genius showed up to race. 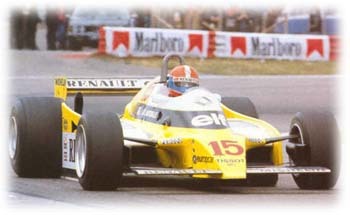 At the start, Villeneuve overtook the two Renaults and led for the first half of the race. On lap 47 Jabouille took the lead and comfortably drove the Renault home to its first victory. The French crowd got their wish but the battle for second place was the icing on the cake. Over the remainder of the 80 lap race Arnoux and Villeneuve fought hammer and tongs around Dijon-Prenois. As Dijon-Prenois was short they were soon lapping most of the field. Arnoux and Villeneuve scythed through the back-markers. On lap 71 Arnoux set the fastest lap of the race. As the laps rolled on, the gap between Arnoux and Villeneuve became smaller until the last two laps they were banging wheels and putting wheels off the circuit to gain or hold position. Arnoux led Villeneuve to start the final lap. Tyres smoking, Villeneuve muscled past Arnoux on the first corner. Going downhill, Arnoux attempted to retake Villeneuve. Banging wheels, Villeneuve went wide and Arnoux led going uphill again. After entering the last corner side-by-side, Villeneuve came out ahead and he held on to second place by a mere 0.24s. It was a battle to remember, the stuff that fantasy races are truly made of. Ewan Tytler © 1999 Kaizar.Com, Incorporated.